Sir Gary Verity, Christian Prudhomme and myself during the pair's visit ahead of the Tour de Yorkshire. Pateley Bridge has its own Angel of the North! Not “Why Aye Man”, but “Y Man”! If you look when driving down the High Street at the gable end of the old Tourist Information Office, you will see the huge white Tour De Yorkshire bike with Y Man who is six foot tall stood on the cross bar. His body is the Yorkshire Rose. Or if you are driving up the High Street and look at the gable end of the building above the pet shop, you will see a ten foot long yellow Yorkshire Air Ambulance helicopter. These are in place ready for this year’s Tour De Yorkshire. Last week I went to Burton Leonard near Ripon to give a talk at Dementia Forward which is a registered charity. Dementia Forward is to be the main charity beneficiary at this year’s Pateley Bridge 1940s Weekend in July. I have also been along to St Cuthbert’s Cof E School for a meeting with the headteacher Lynette Brammah. I was at the school to discuss the children’s participation with the Pateley in Bloom Group for this year’s Yorkshire in Bloom competition entry by the town. 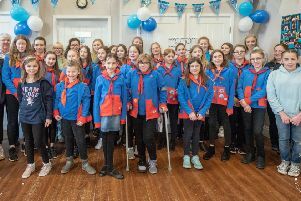 The exciting news I was able to share about this year’s entry is that a TV production company will be filming the Pateley Bridge groups’ efforts while they pursue the gold award. The filming of the Pateley in Bloom community groups working on projects will start in a couple of weeks and continue up to and including judging day in July. The footage will be used for the second series of BBC’s ‘Britain in Bloom’ programme. On Monday I went along to the Yorkshire Business Market in Harrogate where I had been invited as a VIP guest. Brian Dunsby OBE who organises the business market introduced the Mayor of Harrogate Anne Jones who welcomed everyone before asking David Kerfoot MBE Deputy Lieutenant of North Yorkshire to officially declare the event open. I am privileged to know all three and it was great to later catch up with them and have a chat. I am delighted that David Kerfoot MBE has very kindly agreed to honour us with his attendance at this year’s Pateley Bridge 1940s event in his capacity as Deputy Lieutenant of North Yorkshire. At the event I met up with other familiar faces, including my friends from Stray FM radio, the team from Visit Harrogate, and Adrian Murray renowned, if not famous, photographer for this esteemed newspaper. As well as Adrian ‘snapping’ me, Karen Weaver of HARVCS took my photo too when I signed up as a friend of the Local Fund which raises money to distribute in the area to local worthy causes. Karen who plays in the Dacre and Summerbridge Silver Band reminded me that she would be in Pateley Bridge playing with the band on Sunday when the Tour de Yorkshire comes down the High Street at around 3.34pm – 3.55pm. Talking of the Tour, Sir Gary Verity of Welcome to Yorkshire and Tour de France boss Christian Prudhomme were in Pateley Bridge on Tuesday to check out the town’s preparations before Sunday. The businesses, residents, children from the local nursery, primary and high schools all enthusiastically welcomed the VIP visitors. Many businesses presented gifts to the two men in appreciation of their visit and for bringing the cycling event to Nidderdale which has resulted in great publicity and the resulting knock on economic benefits. Sir Gary was even presented with a scroll showing his family tree by Phil and Bev of Folk Finders. Thank you to everyone who turned out to welcome Sir Gary and Christian – you did Pateley Bridge proud!